On April 17, 2011 Alfred M. Freedman M.D. died in New York at the age of 94. He left behind a wife, two children, two grandchildren, innumerable colleagues whose careers were greatly influenced by him as well as a mental health community with untold numbers of patients most of whom will never know how his career has led to improvements in their care. I first met Dr. Freedman in 1980 when he hired me to be on the faculty of New York Medical College. He was at an age at that time when one might mistakenly think he was in the twilight of his great career. He had already edited what was clearly the definitive textbook in Psychiatry. Generations of psychiatrists learned psychiatry and prepared for their board examinations by reading Freedman and Kaplan. New psychiatrists to this day read the later versions of this book which he originated. When I met him, six years previously, he had been elected the 102nd President of the American Psychiatric Association after his name had been placed on the ballot through an unusual membership initiative. After his arrival at New York Medical College, he built the Department of Psychiatry from a part time faculty to a major institution on both the local and national scene with innovative programs in many areas particularly in substance abuse. He had moved the departmental office to Westchester where I would be working in consultation liaison psychiatry and integrated the department into Grasslands Hospital which would become known as Westchester Medical Center and the Psychiatry Department as the Behavioral Health Center. He also supported the New York Medical College Psychoanalytic Institute. His welcoming words of advice to me were to tell me that I should always remember that we are team players in this department. While there was never a doubt that he was the leader, he ran the department allowing the Associate Chairs and the division heads to all be creative and reach their full potential. He supported and personally encouraged the most junior faculty members. He was always very generous to his faculty. I recall at one time when I had developed some expertise and experience in disaster psychiatry he decided to make me the head of a small subdivision in the department, which he called an “institute” in this area and he insisted that I design some stationery to show this. He gave me the opportunity to write a paper with him in 1984 about depression, which was ultimately translated into German. Having my name on paper with him is one of the very special moments of my career. There are many other colleagues who have similar stories as he always made you feel as if you were an equal working together on the same team. The residents always loved him and he was a role model for every young psychiatrist who trained at any of the hospitals, which were part of the New York Medical College consortium. Dr. Freedman’s parents where immigrants from Poland and they worked long hours in a small family store to send all their children to college and two of them to medical school. I only now realize that Dr. Freedman was an undergraduate at Cornell at the same time as was my father in law David Groner. It is a pleasing thought to me that somehow their paths may have crossed. I would like to reprint a section about Dr. Freeman’s training and early career from a biographical piece written by Dr. Freedman’s friend Dr. Leon Eisenberg on the occasion of Dr. Freedman’s term as President of the American Psychiatric Association 1973-1974 (Am J Psychiatry 131:7, July 1974) …. During his college years, Sir Arthur Eddington’s lectures briefly inspired thoughts of a career in atomic physics, but the call to medicine could not be denied. Yet those were days when an unofficial “numerus clausus” prevailed in American medical schools: a would-be physician had reason for anxiety about his chances for admission despite impeccable grades and recommendations. The list of schools that rejected our future President is long and distinguished. By great good fortune he applied to the medical school of the University of Minnesota and was accepted. The early years in medical school were somewhat of a letdown in comparison to the exciting intellectual horizons college had opened. What made them more tolerable were the evenings and weekends he spent as research assistant in neurophysiology with Professor Herman Kabat, work which resulted in his first two publications on experimental shock. Once his clinical rotations began, medical school came to life: he can still recall many of his first cases in medicine and psychiatry. His commitment to care for urban poor led him to take his internship at Harlem Hospital, where he became aware of the problems as well as the challenges in providing medical care to neglected populations. The year also began his love affair with New York City. He enlisted in the Army right after Pearl Harbor and was assigned at the end of his internship to Arthur Mirsky’s laboratories at Miami. The most important consequence of this duty station stemmed from a routine assignment to accompany a troop train to Colorado Springs. On his return journey he had gotten as far as St Louis, where he found himself momentarily stranded. Just before the departure of the next train, the ticket clerk called him frantically to offer him a last –minute cancellation. On that tain he was introduced to a Miss Marcia Kohl, who was returning to her home in Miami from college in Ann Arbor. Neither one had any difficulty recognizing that his chance encounter had been fated. Within six months, they were married and have remained, happily so, to this day…. Alfred’s army years were completed at the station hospital of the Third Air Force in Gulfport, Mississippi and he was discharged as a major in 1946. He undertook training in pathology at Mt. Sinai Hospital in New York City (1946-1947) in pursuit of a plan to prepare himself for the study of the biological basis of human behavior. He briefly contemplated completing his training in pathology but he left it upon receiving an invitation from Dr. Harold Himwhich, whom he had met when he was a medical student, to join him as a medical physiologist at the Army Chemical Center at Edgewood. His studies of acetylcholine and cholinesterase, with the use of diisopropylfluorophosphate as an enzymatic poison led to significant publications in the American Journal of Physiology and the American Journal of Psychiatry on the mechanisms of convulsions. Satisfying as he found laboratory work to be, he was drawn again to clinical activities and began his general psychiatry residency training at Bellevue Hospital in July 1948. Upon completing his basic training, he joined Dr. Lauretta Bender as a Fellow, then as staff psychiatrist on the Child Psychiatry Unit (1950-1954). From that period stem Alfred Freedman’s important papers on childhood schizophrenia and his first publications on pediatric psychopharmacology. After Dr. Freedman stepped down from Chairmanship at New York Medical College he seemed to be as active as ever. I would frequently see him and Marcia at various gatherings and psychiatric meetings. He was always warm and friendly. He was also quite vigorous and had taken up the cause of human rights, which I know was never far from his heart. 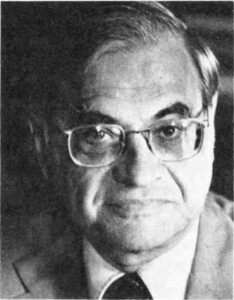 During his APA Presidency he had led a delegation to the Soviet Union and had spoken out about the detention of political prisoners in psychiatric hospitals in the USSR. In his later years he became one of the leading spokespersons, along with his friend and colleague Abe Halpern, in advocating that psychiatrists do not take part in execution in any manner and also that psychiatrists do not take part in the interrogation of prisoners. Their well reasoned ethical arguments continues to influence discussion on this very important topic. Dr. Freedman made very important contributions to revising the World Psychiatric Association Code of Ethics. He also received the APA’s Human rights Award. In the course of his academic work and his advocacy of human rights, Dr. Freedman has lectured all over the world. It is well known that during Dr. Freedman’s presidency of the APA, homosexuality was eliminated as a designated psychiatric disorder in the official diagnostic statistical manual (DSM). At the time this was a momentous change with far reaching social and legal implications for people with a homosexual orientation. The beneficial effects is still being played out today as we see the armed forces finally eliminating discrimination of gays and lesbians in the military. Four years ago I had a Podcast on the Internet where I would interview various psychiatrists. During one of his visits to Valhalla (New York Medical College) I invited Dr. Freedman to be my guest on the Podcast. He was then 90 years old and graciously accepted the invitation. He shared with me the behind the scenes activities on how he influenced this important event in American Psychiatry. He also spoke of other important issues in his career. I would like to provide the links to the full audio broadcast of that interview and the You-tube video presentation which is divided into segment one, two and three. In it you will hear and see Alfred M. Freedman, a modest, gentle giant of American psychiatry.